We’d love your help. Let us know what’s wrong with this preview of Superbosses by Sydney Finkelstein. To ask other readers questions about Superbosses, please sign up. Superbosses is everything that is good and bad about business books. There is a core good idea: some leaders are very good, intentionally or unintentionally, at developing talent, and maintaining networks of current and former employees or protégés. Finkelstein conducted interviews with famous leaders across industries who seem to meet this definition, grouping them into 3 main types, and then contrasting their behaviors vs normal bosses. Some of this seems to be taken a bit too far to justify pe Superbosses is everything that is good and bad about business books. There is a core good idea: some leaders are very good, intentionally or unintentionally, at developing talent, and maintaining networks of current and former employees or protégés. Finkelstein conducted interviews with famous leaders across industries who seem to meet this definition, grouping them into 3 main types, and then contrasting their behaviors vs normal bosses. Some of this seems to be taken a bit too far to justify personal quirks on the part of some leaders. None of this is really tested or analyzed in a quantified way. I'll take some of the advice because it seems both good and harmless, but other things seem overly capricious and downright toxic. Every time I read a book like this I am like, this would make a good Economist supplemental issue. Because its goddamn miserable as a book. This is a book by a Professor at Dartmouth's Tuck School about "Supermanagers" and how they operate. As best as I can tell, the intuition is that a Supermanager is someone whose firm or organization has achieved outstanding and continued performance under that person's leadership and whose tenure is marked by extensive and prolonged work with protégés in an apprenticeship format in which junior managers are trained by the Supermanager to succeed in the firm and who subsequently move on to outsta This is a book by a Professor at Dartmouth's Tuck School about "Supermanagers" and how they operate. As best as I can tell, the intuition is that a Supermanager is someone whose firm or organization has achieved outstanding and continued performance under that person's leadership and whose tenure is marked by extensive and prolonged work with protégés in an apprenticeship format in which junior managers are trained by the Supermanager to succeed in the firm and who subsequently move on to outstanding performance after leaving the firm by becoming a leader elsewhere and thus joining the alumni network of the Supermanager. Supermanagers are individuals who develop a critical vision of their industry and know how to implement it. By nurturing protégés, management depth in a firm is developed which assures the firm's continued success and spreads the keys to success through the industry in question and to related businesses. The punchline is that by understanding Supermanagers, who while unique can still be observed and chronicled, regular managers can make progress in improving their own performance and perhaps even become Supermanagers themselves. .....that is at least what the claim is, but upon closer examination this book is very disappointing. If these managers are so unique - and that is the claim -- then conducting structured interviews with a bunch of them and their protégés will not necessarily provide much insight into what they do or how the uninitiated can join the club. Top managers have been the focus of business research for a very long time and to this day little is really known about them. Anyone who is curious should go and read Chester Barnard's "The Functions of the Executive" or some essays by Mary Parker Follett. It is very unclear to me that current studies of top management have much more to add to what we know than these early classics. This is a theoretical problem and not a matter of bad research - although there has been plenty of that. Many of not most of the systems of firms and large organizations have been rationalized and standardized through the use of bureaucratic rules and a variety of analytic scheme, from accounting systems, to corporate finance, to various decision science schemes, As the firm has become more rationalized, the top of the firm is where these different subsystems come together in order for the entire firm to function in a consistent fashion. That integration will of necessity be less rationalized and highly idiosyncratic so that a given firm can function in a given setting facing a specific set of problems. It is hard to come up with a standard routine way of organizing decisions at the top of the firm, which makes the result inherently less organized, messier, and fuzzier for managers. These are the decision areas that Finkelstein is concerned with and it is very hard to come up with a general approach to what such Supermanagers do, since it will depend greatly on the time, the location, and particular business, and the people. Finkelstein notes this in his introduction and then proceeds to offer a standardized and general approach for learning from these special managers that does away with all the complexity. One cannot have it both ways. This problem is clear from the initial identification of Supermanagers onward. That the individuals discussed are top (super)managers is made clear by their firm's performance - even though how top managers contribute to that performance is less clear. Given a strong performance record, if one goes around asking managers and their protégés the reasons for their success, it is certain that reasons will be provided that focus on the knowledge, skills, and personal attributes of the managers. "Dumb luck" or the mistakes of others are seldom cited as reasons for one's success? The fundamental attribution error remains alive and well in top management research. The second part of Finkelstein's argument concerns the value of the Supermanager training protégés who go on to excel elsewhere. This no doubt happens and the training and recommendations of the mentor may help to explain it - but what is really new about that? Again, if we do not know much about what constitutes good management besides aggregate results, is it surprising that managers with experience at successful firms will be seen as valuable elsewhere? In a risk averse management world, why not hire someone who has served time with a winner? Why is this new? The case studies have some interesting details, but the individuals that Finkelstein focuses upon have had well publicized careers - to say the least. The industries selected are varied, but do we really need more analyses of football team success or high end gourmet restaurants? ... And is there something else to be said about Larry Ellison's management style that hasn't been said? Not here. The conceptual problem is that the book sets up Supermanagers as unique industry transforming individuals who do not follow standard human resource scripts but instead display an intense intuitive grasp of the business. Having defined one's phenomena that way, it is somewhat disconcerting to continue into the book and find a fairly standard trade approach to the topic in which a few fairly straightforward arguments are repeated numerous times, with breaks taken to drop a few more names of the business deity. If it is what is claimed, it does not strike me as something that can be neatly summed up in some HBR articles/chapters. When my boss recommended and lent this book to me i thought: oh another management book, great... But i found just what i needed, examples of great people, people i can aspire to be. This book does an analysis of the traits the best bosses in the world have, to my surprise is not about them, it is all about what they can do for their employees that makes them great, their positive influence on other is what makes them successful, this is mentioned over and over again with many different examples When my boss recommended and lent this book to me i thought: oh another management book, great... But i found just what i needed, examples of great people, people i can aspire to be. This book does an analysis of the traits the best bosses in the world have, to my surprise is not about them, it is all about what they can do for their employees that makes them great, their positive influence on other is what makes them successful, this is mentioned over and over again with many different examples. In this time of my life where i have the honor to lead a team i feel super energized by this book to be the best boss possible for them and with them succeed. I normally steer clear of books with a low rating (unless I've been personally referred), but this book was a gift from a good friend so I thought I'd give it a try. I got through the first 70 pages and then progress ground to a halt. It started becoming too repetitive. Sydney seems to have done a good job of researching and finding these "superboss" examples for us, but the constant context switching between anecdotes doesn't work for me. This book attempts to identify the similarities between bosses that have a great deal of success in not only running a business, but also in hiring, retaining, and motivating exceptional employees. 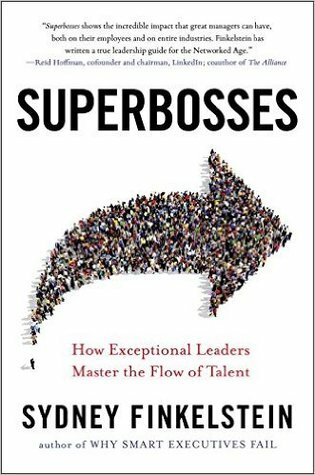 The author accomplishes this through his many different stories of people that exhibit the traits of a superboss. This approach exposes the readers to some techniques that are characteristic of superbosses, but is far from a "how to" guide for those wanting to follow in the footsteps of the greats men This book attempts to identify the similarities between bosses that have a great deal of success in not only running a business, but also in hiring, retaining, and motivating exceptional employees. The author accomplishes this through his many different stories of people that exhibit the traits of a superboss. This approach exposes the readers to some techniques that are characteristic of superbosses, but is far from a "how to" guide for those wanting to follow in the footsteps of the greats mentioned in this book. 1) This book was published in 2016. Hilary Clinton was one of the 12 people cited as being an example of a superboss. Donald Trump was the only person who was cited as being an example of a bad boss. 2) I desperately wanted to like this book when I picked it up. The same generalities are repeated through out the book - I believe the same thing could have been written in 10-20 pages. This is the first book that I have marked as 'read' on goodreads w 1) This book was published in 2016. This is the first book that I have marked as 'read' on goodreads without reaching till the last page - it was getting so repetitive that I guess reading 40% was equivalent to reading the whole. 3) I personally like story-telling to emphasize ideas and concepts. The book highlights unconventional competencies of hyper-successful leaders who develop other highly successful leaders and mentors. While the concept is interesting and almost compelling, the writing style lacks organization and spends significant page space to document the talent webs of these leaders which could have been summarized as a few charts in the appendix. I wanted to love this book, however the reader has to work too hard to pull out the golden nuggets. Me encantó este libro. Para quienes empezamos a desempeñarnos en cargos directivos y de gestión, este libro da orientaciones claras y simples para generar transformaciones en los contextos en que trabajamos. Fundamental la recuperación de los sentidos de nuestras tareas y esa "intuición" que descubrimos en nosotros cuando estamos conectados plenamente con lo que hacemos. A nice book that should be able to help me in setting up my company as an open attractive learning environment and how it helps to let people grow as employees and as persons. Only could have done with a bit less repitition and some more concrete focus on tools that help apply the lessons in real life for bosses around. I was expecting more from the book, reading the reviews on the cover! But felt that it hardly offers any insight. Most of the examples are American and not that well known outside of USA. Felt like it was just repeating the same points throughout the book. The writing style is also not engaging at all. I just ran towards the end to just get it over with it. What an excellent book. My husband came home with this book and I have been spouting the knowledge of this book all week long, my colleagues probably are sick of it! But it makes sense. Now I need to go forth and get it done. Had very high hopes for Sydney Finkelstein. The first chapters of the book are very sleepy and used the word boss/superboss very too often without any aid for the readers to help understand the author's purpose. Points were weak and barely believable. Had some interesting anecdotes, but didn't really provide advice, and referred to the same eople over and over. More wonderful tales of great bosses and mentors. Unfortunately the book could be more condensed and deliver the same results with probably three fewer chapters. un buen libro para entender como evoluciona el estilo de liderazgo en nuevas formas de trabajo. Nice book. So many examples that I can reflect on. Good research and insights, but the book would have been twice as impactful if it were half as long. malísimo, leí hasta la pág. 120. creo que habla como de los jefes de la rev. industrial que actualmente no se han extinto. A must read for any manager that wants to take their performance to the next level! Professor Sydney Finkelstein shows how we can emulate the best tactics of superbosses to create our own powerful networks of extraordinary talent. A must-read for anyone interested in leadership and building an enduring pipeline of talent. I wish this book was 20-30 pages for there some great points in here. This was a bit disappointing. I heard him on the Coaching for Leaders podcast and was excited to read the book but felt it suffered from wandering anecdotes. There is a lot of good stuff in here, but I think it could have been a bit more focused in the message and then used the anecdotes to support. First, the bad: the book sometimes feels like a set of elaborate conclusions drawn from specific individuals. The sample size is not that great and sometimes you wonder whether the experience presented of the superbosses really backs up the presented theories. Some of the theories, albeit true, sometimes seem kind of trivial and obvious, although that might be my opinion. That aside, it presents excellent and timely conclusions. I particularly enjoyed the sections on the alumni communities and wh First, the bad: the book sometimes feels like a set of elaborate conclusions drawn from specific individuals. The sample size is not that great and sometimes you wonder whether the experience presented of the superbosses really backs up the presented theories. Some of the theories, albeit true, sometimes seem kind of trivial and obvious, although that might be my opinion. That aside, it presents excellent and timely conclusions. I particularly enjoyed the sections on the alumni communities and what employees do after they leave, which closely ties in to Reid Hoffman and Ben Casnocha's "The Alliance". I love how the examples tie in to start-ups and specific cases. The book repeats the same ideas over and over again which, from a learning perspective, I suppose makes sense. You want this stuff drilled into your head. But from an interest perspective, I found myself wanting to skip sections at a time whenever I wasn't listening to the accompanying audio book. It's all the same things, the only difference is who embodies the idea best at the time. Still, the concept of "Superboss" itself was interesting to me. I like to feel passionate about the projects I'm The book repeats the same ideas over and over again which, from a learning perspective, I suppose makes sense. You want this stuff drilled into your head. But from an interest perspective, I found myself wanting to skip sections at a time whenever I wasn't listening to the accompanying audio book. It's all the same things, the only difference is who embodies the idea best at the time. Still, the concept of "Superboss" itself was interesting to me. I like to feel passionate about the projects I'm working on. I like being trusted to handle projects on my own, to be allowed to take risks and pass or fail on my own merits. I like having a leader who cares about my growth and development, and takes an interest in me because they see someone able to think outside the box, someone who could grow beyond their understanding and in turn, enrich them for it. When I think of a superboss, I think about the person I'd like to work for, and to my surprise, I find that person to be myself. From my own experiences working with a bunch of different roleplayers for a multiplayer video game, I found myself often leading and directing talent much like the superbosses described in this book. It turns out, if you're really good at something, and you want to help other people become really good at the same thing, that's not a bad thing. Sure, they could become competitors for you down the line, but so what? Competition does not mean you can't also collaborate, and the fact that people can't often see past a simple friends/enemies mindset is sad, and I can't help but wonder how boring the world would be in those eyes. The book offers a different perspective on leadership and the role of a leader itself. I'd give it 5* if it was shorter, more to the point and if it had an applicable summary. Nevertheless, it's original in its approach and worth the time. “You have a choice when it comes to talent: hire and develop people who will reach a natural ceiling, and keep them forever; or cultivate a new generation of talent that intends to surpass you, and help them do it. These superperformers will not be satisfied The book offers a different perspective on leadership and the role of a leader itself. “You have a choice when it comes to talent: hire and develop people who will reach a natural ceiling, and keep them forever; or cultivate a new generation of talent that intends to surpass you, and help them do it. These superperformers will not be satisfied playing second fiddle, so unless you can keep growing at a pace that constantly opens up new opportunities for your stars, you will lose them. I’ve had more than one CEO tell me that this is nuts; why would we plan to lose our best talent? Here’s what they don’t get: their star performers will leave no matter what. The best people are constantly looking for more opportunity, more challenge, more accomplishment. The only question is whether you will leverage your best talent to create career-long connections that provide ongoing payback via new opportunities for business transactions, talent acquisition, and investment deals. And this will be even truer as the careers of millennials accelerate.